AFC - 11/06/04 They Still Test on Dogs!?! Protest against Procter & Gamble (P&G) owned pet-food company Iams will take place on Saturday, November 6, 2004, at 12 noon. 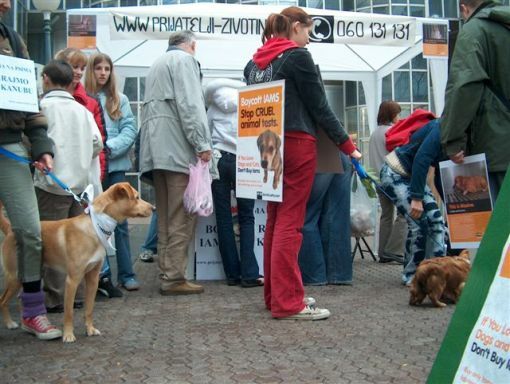 Animal Friends' activists together with the dogs, carrying bandanas around their necks, will hand out leaflets on the main city square and Gajeva street, thus inviting fellow citizens to boycott Iams. PETA undercover investigation revealed deplorable conditions at an Iams contract laboratory in the United States: Terrified, unsocialized animals cowering in their cages and suffering from untreated ear infections and injured paws, dogs' vocal chords surgically cut out so that they couldn't bark, dogs being force-fed vegetable oil through tubes inserted down their throats, a live kitten who was washed down a drain. 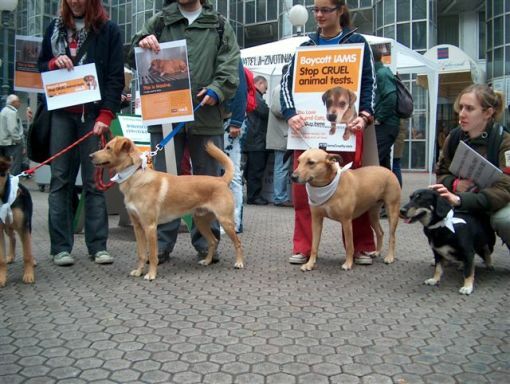 As a result of PETA's campaign to end Iams' use of animals in painful pet-food laboratory experiments, Iams announced that it will stop using university and private contract laboratories for its pet-food tests and transfer tests to its own Dayton facility within two years, as well as stepping up the use of home testing and testing in animal shelters and other non-laboratory settings. No one who cares about dogs and cats should buy Iams food while the company still allows any animal to suffer in tests that it is not legally required to conduct in the first place. Credibility is another factor. As early as 1999, Iams announced that it would no longer kill animals at the end of studies, and yet it is believed that a current Iams study protocol at Auburn University in the US calls for 80 to 120 geriatric beagles to be impregnated and then killed after their puppies are weaned. Replacing dogs and cats with other animals as it has at Purdue University in the US, where it has just given $195,000 to study muscle atrophy in mice until June 2006. Muscle atrophy in rodents is created by suspending the animals by their tails for weeks or months at a time. Purdue is currently conducting kidney-failure experiments on dogs for Iams that will continue until July 2005. Expanding its own Dayton facility, meaning that it has no intention of giving up all experiments on dogs and cats. Continuing to fund chair positions at universities where nutritional testing is conducted. Often, the experiments in physiology and other departments at universities are worse than those that Iams conducted prior to being bought by P&G, resulting in the mutilation and deaths of dogs and cats used in bone-formation experiments and other equally cruel, painful tests. Refusing to allow PETA to tour its retirement locations. There is nothing proprietary about such facilities. 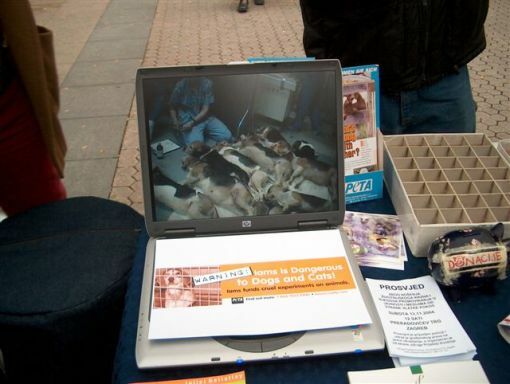 Indisputable evidence of cruel testing on dogs can be seen at www.IamsCruelty.com, as well as on the video shown at the protest.